Each month, RMHCA and Children’s of Alabama come together for a L.I.F.E. class at the House. These hour-long sessions cover topics that help the families staying with us and going through a medical crisis learn to live life to the fullest. L.I.F.E. stands for Learn, Integrate, Function, Engage. Topics cover everything from child development and grief processing to accessing community and state resources — anything that can help educate and support the caregivers staying at the Ronald McDonald House. In 2015, RMHCA was honored to receive the Hearts and Hands Award from RMHC for L.I.F.E. We have loved seeing the success and have been able to grow the program more with each class. 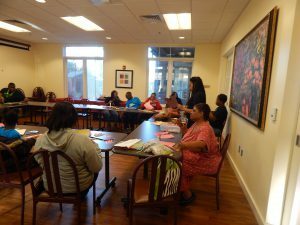 This month, Cristal Cummings, Team Leader and Primary Therapist at Children’s of Alabama spoke on the importance of disciplining a child even during an illness. She is a Licensed Professional Counselor and Registered Play Therapist and really has a knack for teaching parents and caregivers ways to challenge their children. “Although parenting can be very rewarding, it comes with daily challenges as well. It is helpful for parents to understand how children think, behave and feel. We all need a little assistance at times in these areas. Managing challenging behaviors and maintaining one’s sanity is a skill that most parents and caregivers want to achieve. A balance of nurturing, structure and consistency is key,” Cristal explained to us.